Faq - Frequently Asked Questions. Ate discs + brake pads + wear warning contact front axle. Attention: take into account the restrictions on numbers pr !! please, take into account the number explanation pr. Click here for more explanation. You will find additional information in the vehicle model table! 2x ate ventilated brake disc drilled front axle kit (4 pieces) ate brake pads with wear warning contact front axle 1x brake anti-squeal paste (do not apply on the friction surface of brake pads or brake discs brake). Before purchasing, please check the information given in the vehicle model table! 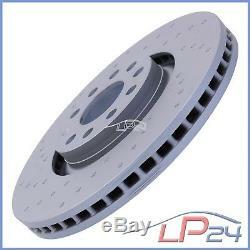 Brake pad set width: 72,9 thickness: 20,3 height: 155,1 / 156,3 wear warning contact incl. Wear warning horn length: 242.5 suitable for braking system: ate brake disc type of brake disc: drilled / ventilated from inside diameter: 320 thickness brake disc: 30 height: 46,5 number of holes: 5/9 with mapp code surface: coated treatment: high carbon content. The quality and safety standards of the original brake parts have far exceeded what is required by the European standard EC-R90. 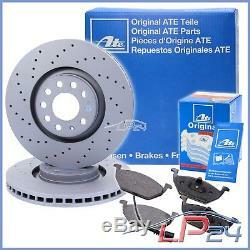 You can rely on proven quality all over the world and thus have an optimal braking quality. By saving consumables such as paper and ink / toner, valuable environmental resources will be preserved. In addition, you no longer have the effort to store, store and search your bill. Have you checked the numbers? An accurate identification of the pr number (equipment feature code) is very important in determining whether the item fits your vehicle or not? You will find further information in point 1.2 of our faq. Product Detail / Product Information. Very low wear and less noise. An additional alloy limits wear and ensures a longer life. 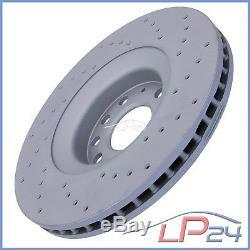 With 4 million brake discs sold, it has been one of the leading brake suppliers in Europe. Total braking performance immediately no fading at ate. Less heat transmission to avoid soft pedals. Optimum comfort prevents squeaks and squeaks. Ate quality mark - enjoy years of experience, standard ece-r90 ate outperform the specifications. Homogeneous labeling simplified traceability in case of guarantee. 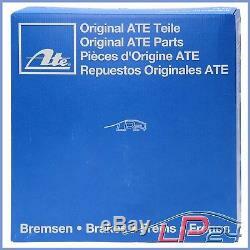 The quality and safety standards of ate braking parts far exceed what is required by the European standard ee-r90. There is less heat transfer with the brake parts ate. The brake fluid is thus protected from high temperatures and no bubbles are formed. Please note the restrictions indicated in the table. 11.04 - 06.08. For the number pr: 1lc location: front axle. 06.06 - 06.08. 09.05 - 09.06. 01.06 - 06.08. 06.05 - 06.08. 10.06 - 06.08. 11.04 - 05.06. 11.05 - 06.08. 11.04 - 07.06. 01.05 - 06.08. Audi a4 front (8ed, b7). 11.05 - 03.08. Corresponds to the following oe numbers. 5l liter 0w-30 castrol edge fst engine oil sae 0w-30 ### fully synthetic ###. Castrol magnatec stop-start 5w-30 a5 engine oil acea a1 / b1 ## also protects engines without a start-stop system ##. Kit set of tools pushes piston brake caliper 13 pieces vw volkswagen ## product brand distributor pro auto parts ##. 5 liter castrol titanium edge fst 5w-30 c3 engine oil bmw longlife-04 # quality mark of the German castrol dispenser #. 5l liters 5w-40 c3 castrol magnatec motor oil acea c3 ## product brand distributor pro auto parts ##. 5l liters 10w-40 a3 / b4 castrol magnatec engine oil renault rn0700 / rn0710 ## product brand distributor pro auto parts ##. 5l liters 0w-40 a3 / b4 castrol edge fst engine oil bmw longlife-01 ### reinforced by titanium fst ###. 1x 500ml presto power bremsenreiniger bremsenspray entfetter spraydose kfz pkw # markenqualitat vom kfzteileprofi - versand ab lager #. 5l liters 5w-40 castrol edge fst turbo diesel engine oil API sn / cf ### reinforced by titanium fst ###. 1 liter castrol titanium fst 5w-30 c3 motor acea c3 # quality mark of the German castrol dispenser #. 5 liters castrol titanium fst 5w-30 ll engine oil acea c3 # product brand distributor pro auto parts #. 180 days guaranteed return period. The cost of return are the responsibility of the seller. You will find our conditions of return in our information intended for the customers. Our service - your advantage! Any customs duties will be borne by the buyer. Note that a delay in delivery may occur due to customs clearance. We do not ship to areas with the following postal codes: 971xx, 97133, 97150, 972xx, 973xx, 974xx, 97500, 976xx, 986xx, 987xx, 98799, 988xx (Guadeloupe, St. Martin, Martinique, Guyana French meeting, Saint-Pierre-and-Miquelon, Mayotte, Wallis and Futuna, French Polynesia, Clipperton Island, New Caledonia). We do not ship to regions with the following postal codes: im (isle of man), gg (guernsey), i (jersey). We do not deliver to the following postcodes: im (isle of man), gg (guernsey), i (jersey). 3418115012 - 3418112012 - 3418111012. C971ff386 ce0188b0b c3f2bbbc7 c6360449a c6c585f91 c9018620b c3195dd54 c6f44ef5f c41944238 c2cb33056 c2d3a5294 c1abeacdb c88b04b1b c1f0e235c c23a8c122 cc9118655 c32ef3b6c ccabd38e9 c9f9f78a4 c0cdc4211 c73671298 c1fb065b4 c880b886b c6f079976 cb4536880 c0e0b0a40 c2a57ecf4 cc4bf8265 c0f6c0bec ce6c30de9 c88c5c2e9 cb04044c9 c971f36cb cbbcd98d8 c0266a300 ca0ed17c5 c0883d4db cfcfae7a3 c08dc291f c6481f8de c93b02cdc c3f9ad417 c4502110d c6bf14d45 c7ce98440 c139b9647 c076a1d56 c5c3d146e c535f47e0 cc63bf564 c9da0afdb c2232b125 ce6b88c78 c0bbe9bbb cdb55a990. Wide range of products for all car brands. Always more than 800,000 pieces in stock. Original new parts from all renowned manufacturers at the lowest prices. Express shipping within 1-2 business days. Secure and flexible payment possibilities. Commercial Register: hrb 2867; Weiden i. Do you still need an article? You will find it in the big universe of .. the item "ate kit set set ventilated discs ø320 24.0130-0185.1 + front brake pads" is on sale since Sunday, May 21, 2017. 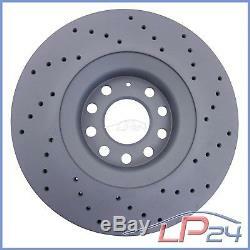 It is in the category "auto, moto parts , accessories \ auto \ parts \ braking \ brake discs.